Amidst the highest property prices in the world, the aspirations for young couples to upgrade and live in a better abode continues unabated in Hong Kong. 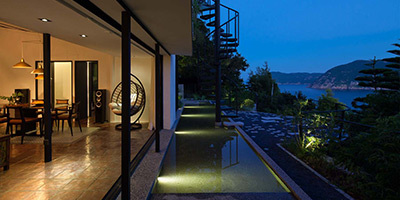 This interior revamps a 25 year old apartment in Mid-Levels to a reductive modern Japanese retreat on the island. Space is premium here so every inch counts whilst utilizing every nook and cranny in the unit to maximize and work as a dual spatial function. This results in the appearance of the ubiquitous bay window as almost every window in this layout is one. Quite interestingly, these boxes ultimately became the design challenge. Bay windows double up as dining bench and study console in the living in order to keep a living space as open and uncluttered as possible. In the master ensuite bedroom, we created a movable Shoji screen door to conceal yet another bay window, wherein a little reading tatami corner is found for the daughter to hide in. Limitless delightful spaces in a finite box.